So it's not sparkling and polished. But it works doesn't it? 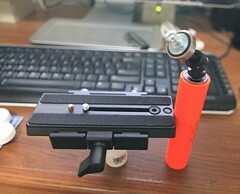 The gimbal is based on the WSCATLER Design #4. It has a Traxxas 5151 as its base and two skateboard bearings. Instead of a flashlight I am using Sch 40 PVC fittings. The base is attached to a Manfrotto 357 for demonstration. The shaft end is M5-.8 according to the metric guide at Home Depot. And skateboard bearing barely fits in a 3/4" PVC pipe. It needs shaving to fit but it will. A Maglite Mini head is the exact diameter of the skateboard bearing on the outside. Forturnately there is no way to shave the inner cavity to make it fit. Use PVC or find another flashlight to use. The brinkmans are too large and the electronics are not easy to get out.